Friday September 29th 1893 It rained all day long. I worked on my tidy and done some mending. Edith stopped for her dinner. Will spent the evening at home. Saturday September 30th 1893 I washed a few things this morning and it was so cloudy I did not get them out till nearly noon. I did some extra work about the place and went up town late in the afternoon. was at Chalfants awhile. I ironed some got our suppers over them we packed up our things ready to go to Chicago on the ten oclock train. Mr Fuller & wife came home last night. We had a very good trip in to the city. She that used to be Adda Fletcher was on the train. 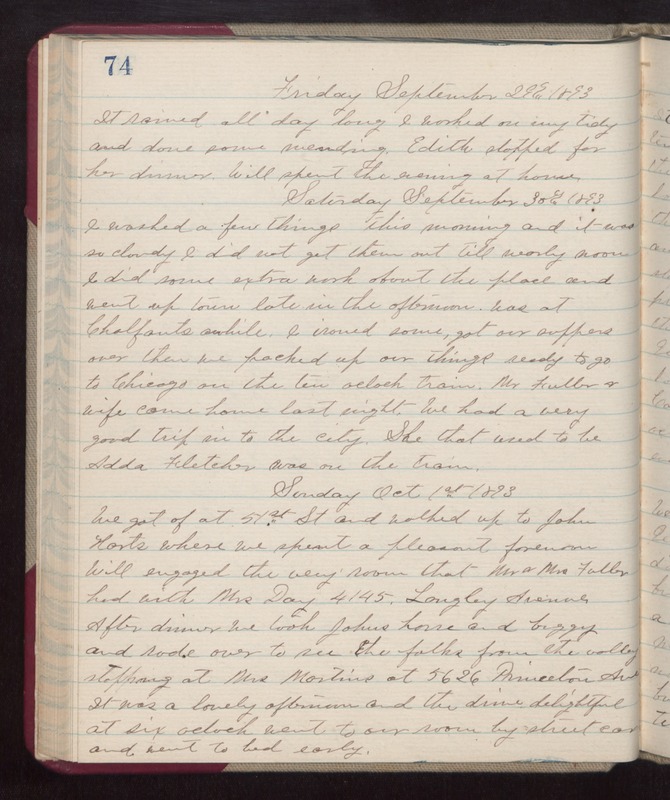 Sunday October 1st 1893 We got of at 51st St and walked up to John Harts where we spent a pleasant forenoon. Will engaged the very room that Mr & Mrs Fuller had with Mrs Day 4145 Langley Avenue. After dinner we took Johns horse and buggy and rode over to see the folks from the valley stopping at Mrs Martins at 5626 Princeton Ave. It was a lovely afternoon and the drive delightful at six oclock went to our room by street car and went to bed early.